An American flag flies over Coldwater Canyon, east of North Ogden, Utah, on November 11, 2018. The flag flies in honor of veterans and North Ogden Mayor Brent Taylor, who was killed in Afghanistan earlier this month. Two tight-knit cities separated by thousands of miles are bound in grief after losing their respective hometown heroes to America’s longest war. 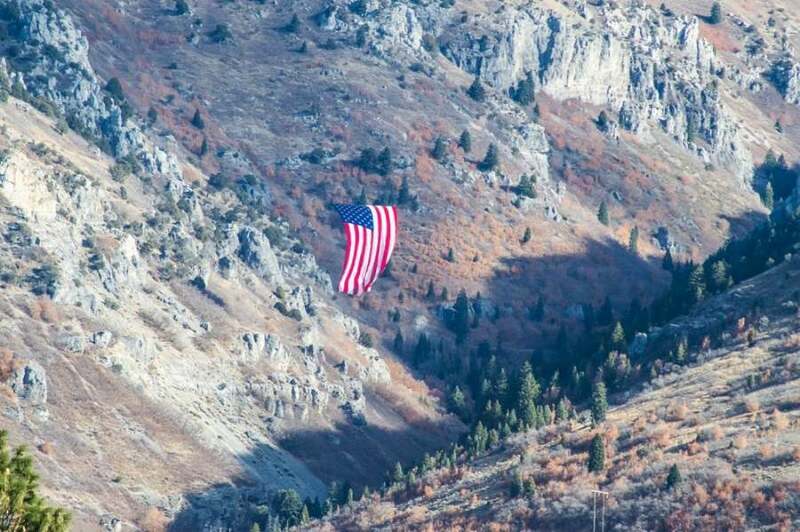 In North Ogden, Utah, a majestic American flag flies over Coldwater Canyon in honor of Mayor Brent Taylor. Memorial services are planned for this weekend. Major Taylor, 39, was killed in Afghanistan on November 3 in a suspected “insider attack” that’s currently under investigation. He leaves behind his wife, Jennie, and their seven children. “Brent was a man of faith, and Jesus Christ was the foundation of all he did and all for which he stood,” according to Maj. Taylor’s obituary. On Monday, the fallen soldier’s wife and parents appeared on Fox News for an extraordinarily moving interview segment. The courage it must have taken for Jennie, Stephen and Tamara Taylor to share their thoughts on national television is unimaginable. Fox News anchor Martha MacCallum started by asking Jennie what seeing the American flag in Coldwater Canyon meant to her. In Morehead City, North Carolina, citizens spent Veterans Day weekend honoring North Carolina Army National Guard Sgt. James Slape. The 23-year-old soldier was laid to rest on Sunday after being killed in action on October 4 by an enemy improvised explosive device. Like Maj. Taylor, Sgt. Slape was a man of faith, according to his obituary. “He had a love of God and attended several different churches in Morehead City and while he was training at Fort Jackson (in South Carolina) and Eglin Air Force Base (in Florida),” it says. 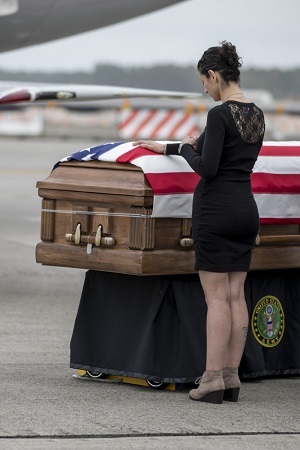 The heartbreaking photo on the left shows the fallen hero’s wife, Shawn, placing her hand on her husband’s flag-draped casket a week ago today in Cherry Point, North Carolina. The image is a poignant reminder of the sacrifices still being made by our troops and their loved ones. In Afghanistan, Iraq, Syria and other dangerous places around the world, our nation’s volunteer warriors are risking everything in defense of others. As Morehead City, North Carolina, and North Ogden, Utah, grieve, please join The Stream in praying for the families of Sgt. James Slape and Maj. Brent Taylor. Most of all, let us ask the Lord to comfort Shawn Slape and Jennie Taylor. “Love of country and a desire to serve was nothing new,” Jennie told Fox News about her husband. “It didn’t start in January with this deployment to Afghanistan, and his love for the country certainly didn’t start when he met me. 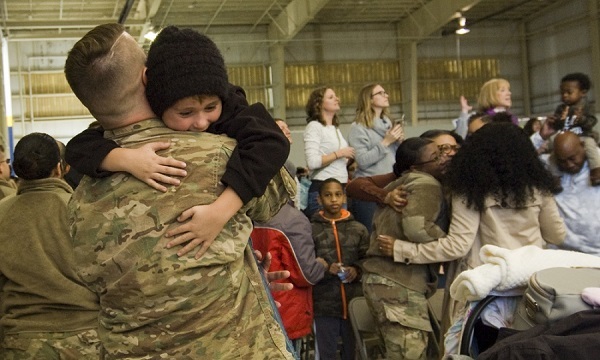 After ten months in Kuwait, approximately 200 members of the Indiana National Guard returned home just in time for Veterans Day. Soldiers from the Indiana National Guard greet family members at the Indianapolis Airport on Saturday, November 10, 2018. Thank you for your service and welcome home, warriors.